...2015 was to see one last time the tree. Use the eggs to navigate through the site! 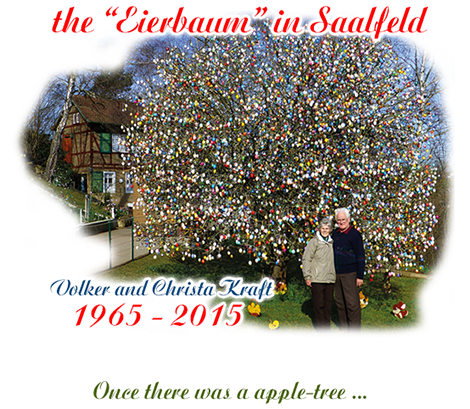 "Eierbaum" is a german word for a tree that is decorated with eggs at the time of Easter. Have fun while visiting our private homepage. Here you can find out everything about the tree. A large gallery and further interesting links make your stay even more enjoyable. All images are self-taken and designed (except #13 and 155 in "Images") and therefore it isn't allowed to pass them off as your own. We hope you like our site - but now, discover it!